Today I have a lovely little post with some great tips and ideas for making the most of small spaces. 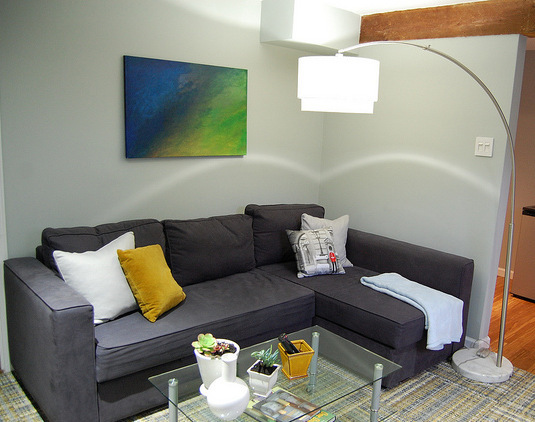 The use of modular furniture and storage focused coffee tables work wonders in small rooms. Enjoy! Sometimes it can be difficult to furnish a flat, apartment or small house if space is a big issue; you may want to keep your home elegant and stylish, but just don’t know how to fit everything in. It may seem impossible, but with the right furniture and accessories, you can create a sense of space in a small home, and rid it of clutter at the same time. The living room is where people often want to create the most space; it is the main room they use when entertaining guests or simply relaxing themselves, and obviously it’s hard to entertain or relax when there’s no space to do it in. Modular furniture is great if you don’t have room to waste: sofas in particular are very adaptable, as you can combine the pieces in different ways to get the most out of your space. Modular sofas are extremely practical if you regularly have guests over, as they can double the amount of places to sit without wasting any room like some two or three piece suites. Also when catering for overnight guests, using a 2 seater sofa bed will be both practical and space saving, especially if you only have a small studio apartment or a guest room with limited space for a proper bed. As well as space-saving furniture and small sofa beds, you can also use accessories in order to make the most out of your small living area. Coffee tables with storage will provide a place to hide clutter as well as somewhere to put your drinks, and getting a nest of tables will similarly be useful for when you have guests. You can also create the illusion of space by painting your walls with light colours, and making use of mirrors (either many or one large one) to make your room seem bigger than it is. great sofa and so practical for both of you stretching your legs!